Longtime customers of Blue Moon Coffee were disappointed to learn earlier this year that the cafe — a longtime staple in Lake Grove — would be shutting its doors. 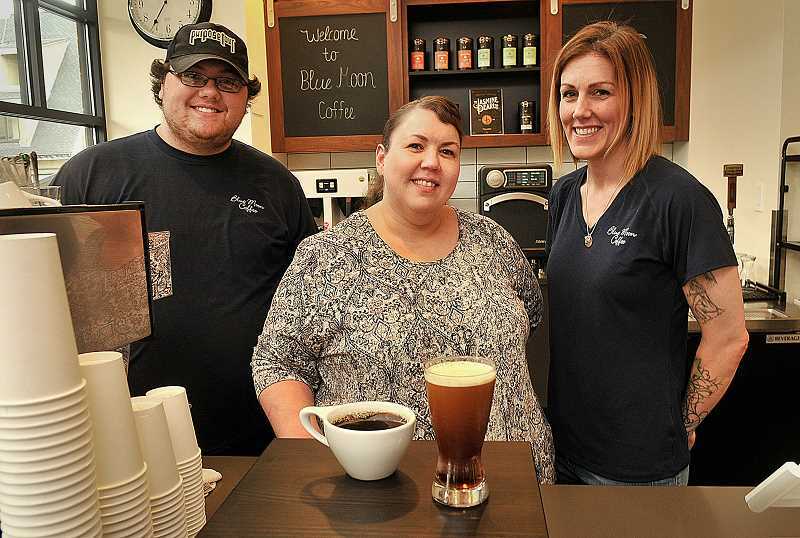 But owner Julia Fowler says she was determined to find a new home for the business, and after several months of preparation, the new Blue Moon Coffee is open for business in downtown Lake Oswego. "There have been a lot of hugs and hellos during the first three weeks that we've been open," Fowler says. "We have the best supporters, and we've also met lots of new faces. We have folks on The Windward construction crew that have already named drinks after themselves." The old cafe was located inside the Providence Mercantile Campus on the corner of Kruse Way and Boones Ferry Road, but last year Fowler and other tenants were informed that Providence was looking to sell the campus for redevelopment — a decision that would eventually require all the existing businesses to move out. The timeline of the potential sale and redevelopment is still unclear, and the center is currently still open. But Fowler decided she didn't want to wait until the last minute and began searching for new locations. The search started in Lake Grove, she says, but eventually expanded to the rest of Lake Oswego, along with Tigard and West Linn. "We have some pretty fantastic customers that kept me very motivated to find a space in Lake Oswego," Fowler says. "I made calls, did research and met with anyone who had an idea about a potential location, just to make sure I was leaving no stone unturned. Can a vacant car wash be turned into a coffee business? I know the answer." 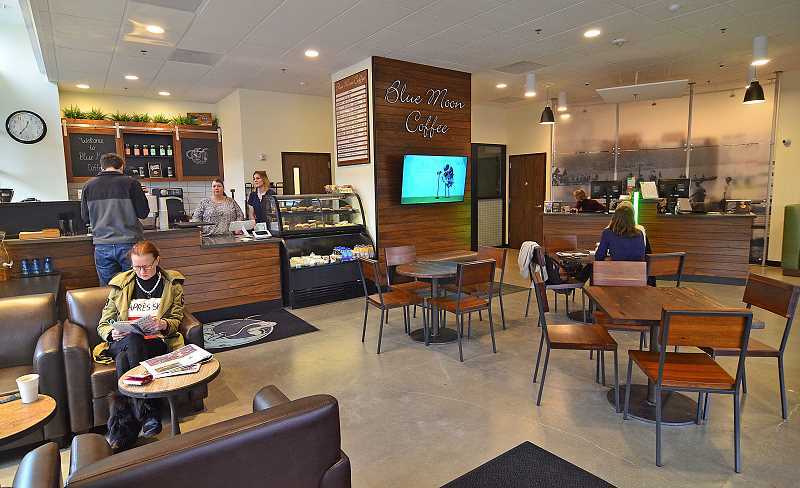 During the wait, longtime Blue Moon regulars were able to tide themselves over at On a Whim Studios in downtown Lake Oswego, which partnered with Fowler to install an espresso machine and begin serving coffee. "I followed her over to ... On a Whim Studios," says local realtor Kay Hawkey, a longtime customer at the original Blue Moon. "You feel a sense of loyalty to (Fowler) because she's an incredible businesswoman, very customer service-oriented and friendly." In the meantime, Fowler continued her search for a new main location. At one point, she says, discussions about a potential space in Tigard progressed far enough that Fowler began working with an architect to design the interior, but she and the building owner were ultimately unable to come to an agreement about how System Development Charges would be split. In the end, Fowler settled on both a new location and a new concept: The new Blue Moon would share a space with the Washington Federal branch at the corner of A Avenue and Second Street in downtown Lake Oswego (220 A Ave., Suite 100), which opened last year. Fowler says she was initially approached by the bank's branch manager a little more than a year ago, who told her the bank was looking to partner with a coffee shop at its new location. "Partnering with the bank gave us the opportunity to not only stay in Lake Oswego, but also to set up shop in a location that we would not have otherwise afforded," she says. "To be honest, this is a very small business operating on slim margins. We would not have had the opportunity to acquire such a prime location on our own." The new location has seating for about 20 people at various tables, plus an attached conference room that becomes overflow seating when not in use. The room can also be reserved for meetings, both by bank clientele and the general public. The overall venue is smaller than the Lake Grove location, but Fowler says the amount of indoor seating is the same. The location currently lacks outdoor seating, but there are plans to add four sidewalk tables in the spring. Staff might feel a bit more of a pinch, she says, because the new location has a smaller kitchen and less behind-the-counter space. But the cafe has adjusted by decreasing the number of made-to-order items in favor of grab-and-go options, which can be made in streamlined batches. There are a few changes to the food menu as a result. But there will still be muffins, pastries, scones and breakfast cookies, Fowler says, and new croissant sandwiches and breakfast burritos have also been added. The beverage menu has remained the same, Fowler says: Blue Moon still partners with Stumptown Coffee and The Jasmine Pearl Tea Company. Some of the employees at the old location moved on to new jobs during the wait, Fowler says, but others have stayed on at either the new location or On a Whim. And the new location's team leader, Nikole Weir, is a familiar face, having previously worked at Peet's Coffee downtown. "It's been great to see the excitement of people about having Blue Moon here," Weir says. "There are a lot of regulars (coming in) from the old store." Fowler says one of her initial concerns is making sure customers know that the cafe and the bank do not follow the same operating hours; the bank is open 9 a.m.-5 p.m. on weekdays only, but the cafe is open 6 a.m.-6 p.m. weekdays as well as 8 a.m.-1 p.m. on Saturday and Sunday. Still, there's been no shortage of customers at the new location during the first three weeks. Blue Moon may now be at the other end of Lake Oswego, but some of those customers say they don't mind making the trek. "This is one of my favorite coffee shops," says Eric Austin, who describes himself as a daily customer at the former Lake Grove location. "It's a little bit further away now, but it's worth the trip." Austin says he also likes the new location's more modern aesthetic, as well as the street-corner location. And Hawkey adds that she's a fan of the combined space. "I think it's amazing to have a bank counter and a coffee shop," she says. "I've never seen that concept before and I think it works really well with the way it's set up." For more information, call the shop at 503-744-4914 or visit www.bluemoonlo.com.